THIS is to inform the general public that the school management of The Federal College of Education (Special), Oyo has announced the Supplementary Post Unified Tertiary Matriculation Examination (UTME) screening exercise. The Federal College of Education Special Oyo Post UTME screening test has been scheduled to hold on Monday, November 16, 2015. 1. Applicants who choose the Federal College of Education (Special), Oyo as their choice of Institutions during 2015 UTME and whose score(s) is 150 and above are eligible to participate in the screening. 2. Candidate(s) who did not choose the College initially but scored 150 and above are also eligible to apply. 1. Applicants will be expected to complete the FCE Oyo Special Supplementary Post UTME form on-line. 2. Each candidate will be expected to purchase a scratch card at the cost of N2,700.00 (Two thousand, seven hundred Naira) only. 3. UTME e-notification of result slip. 4. Original and photocopy of the print-out copy of the on-line completed Post-UTME application form. 5. SSCE/GCE O’Level results or equivalent. 6. Writing materials: Pencils, Sharpeners, Erasers, etc. Candidates who did not choose the Federal College of Education (Special), Oyo initially will bear additional cost of Change of Institution i.e. N2,500 (Two thousand, five hundred naira only) in Bank draft of any Commercial Bank in favour of Federal College of Education (Special), Oyo and obtain receipt at the college Bursary- Students Account. Original and photocopy of receipt should be brought along with other requirements for screening stated above. 2. After purchasing it, you are to Log on to the college’s website at: www.spedoyoportal.com and click on Post UTME application under prospective student. 4. When the online form page opens, fill in your details, submit and print your photo card. 5. Bring the photo card along to the venue of the screening exercise. Candidates are to please take note that submission of the application form for the post UTME on the College website will close on Monday, 16th November, 2015. VENUE: Venue: As indicated on the print-out copy of the online completed Post-UTME form. 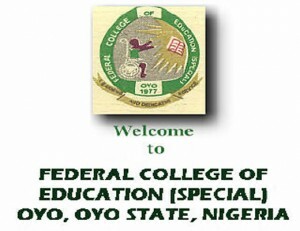 Candidates who want to apply for the FCE Oyo 2015/2016 Supplementary Post-UTME Application should CLICK HERE TO APPLY.